...Shell Guides have become a national treasure , so it’s no wonder they are high prized . Prices ? Well, let’s start at the lunatic end of the market with Ken Deighton of Bournemouth . Is there some mind-bending ray given out by the Net ( like the ozone from photocopiers ) that turns otherwise sensible dealers into rapacious monsters ? Or could it be the sea air in Bournemouth ? On hearing of Deighton’s I was reminded of Deighton and Bell, a once famous antiquarian bookshop in Trinity Street, Cambridge fronted for many years by the late lamented and incomparable Patricia Huskinson, descendant of the first man to be run over by a train, friend of everything and everyone Polish and of poets, in whose home in Barley you were likely to find yourself having breakfast with Jon Silkin or taking tea with Geoffrey Hill, as I did. I rang up old Ken in Bournemouth and asked if his shop had any connection with the much missed Cambridge premises . I was told that no, it didn’t, but he wished it did, such was the reputation of Deighton and Bell. Well, Ken, I can assure you that if Patricia H. had been asked by her boss to demand £950 each for what were basically remaindered copies of the original spiral bound firsts that Faber had inherited from Batsford, and had cased, adding a new jacket and a cancel title page, she’d have dropped dead with shame. If they feel that asking an extra £800 odd for a bit of seventy-year old board and a jacket is acceptable they must be living on the planet Zanussi. Incidentally, I have two of these cased Fabers ( Cornwall and Somerset ) without the jackets, one of which I picked up in a Letchworth junk shop for twenty pence. If you look closely, you can see the join where the new title page has been stuck in. Yes, they are rare, even very rare, but if other dealers ( St Mary Books and Prints, for one) can charge sensible prices for similar copies, why can’t D of B? Actually, Deighton’s seem to be exceptions. Most of the prices of Guides on the Net are not extortionate, though very few are cheap. There are some anomalies, though. Back in 1982 in Sussex I bought at a bookshop ( not a jumble sale, as Chris Mawson claims in his otherwise excellent Shell Guide site ) four of the early spiral bound Guides for 50p each, not realising back then that they were rare. But actually, not all are that rare. Take Bucks by John Nash. About 15 years later I bought another Bucks ( can’t remember where ) for just £1.50 and just a year or so ago there was at least copy on ABE priced at around £30 . Today Rota are offering a Bucks at $215, something of a rip. According to them this title is ‘ one of the least easily found volumes ‘, whereas in fact it is one of the more common ones. It’s also one of the best. The book is more valuable as a guide in its balanced view of the county, its presentation of facts, and its visual qualities than Hants, Derbyshire or Somerset. 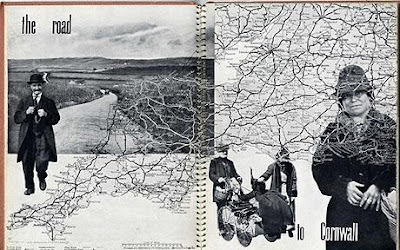 I have suggested elsewhere that it was while editing Bucks that Betch was inspired to write his famous poem ‘Slough ‘ and that the wonderful photomontage of Slough by the mysterious ‘ Cecil H Greville’ was actually assembled by wily old Betch himself. Betjeman’s Devon and Cornwall aren’t as expensive as you would think, considering they are prime example of Betch at his finest ranting- against- suburbia phase. ABE have a Devon at $144.72. Kent and Derbyshire don’t seem to be particularly sought after and can be found for under £50 each. Wiltshire, compiled by Robert Byron in 1935, is another matter entirely. It used to sell many years ago for well under £50, but today is recognised as one of the more sought after titles, possibly because Byron, who was killed in the War, was also the celebrated author of The Road to Oxiana. When Faber took over publication David Verey was invited to update the text , but a good deal of what had appeared 21 years earlier, was retained, including much of the title page and Byron’s ‘ angry ‘ notes on Antiquities. If you are buying through ABE expect to pay anything from £150 to Deighton’s $379.30. If you can wait, you’d probably get a copy at some jumble sale somewhere for a quid. Great reading your blog- thanks. I run a small bookshop in Bucks. I have a copy of this Shell Guide in Faber's spiral comb with card covers and dustjacket. It says three and sixpence rather than two and sixpence however. 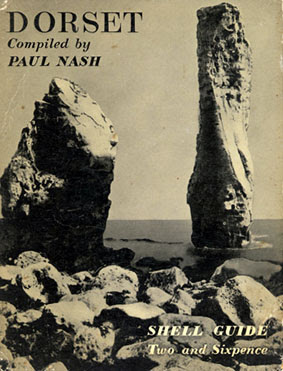 Do you know the earliest date Faber published the Dorset guide? I can only find 1966 on the Shell chronology but that copy seems to be by Michael Pitt Rivers. My copy has the same cover as the one that you show in your picture. You might be interested in the new book from Libri Publishing: 'A Shell Eye on England: the Shell County Guides 1934-1984'. It's a fascinating and comprehensive history of the Guides. I was lucky enough to buy several of the pre-War titles for £2 each about 30 years ago; my Nash 'Dorset' came out of a skip after a sale or auction!